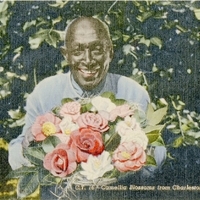 A postcard depicting a man holding a variety of camellia blossoms from gardens in Charleston, South Carolina, including Middleton Gardens and the Magnolia Plantation and Gardens. Magnolia Gardens, which introduced hundreds of varieties of the plant to the United States, has an extensive collection of camellia plants, and continues to organize and implement a worldwide search for Ancient Camellias which are in threat of extinction. "Charleston's Most Visited Plantation." Magnolia Plantation and Gardens. http://www.magnoliaplantation.com/. “Camellia Blossoms from Charleston Gardens Postcard.” RICHES of Central Florida accessed April 26, 2019, https://richesmi.cah.ucf.edu/omeka/items/show/6737.